The K-band Tx was switched on from August 10 to October 31, 2003. During this period (except for one week vacation in Greece) the majority of the visible passes were observed. Visible means here in the actual sense, since my neighbour's house allows me to work AO-40 at low elevations only if the azimut is greater than 105 degrees, and to the west the satellite disappears behind the hills of the Vienna Woods at elevations around 3 degrees. Otherwise there are minor obstructions by a few trees in my own garden and, of course, other antennae and antenna masts just next to the dish. The central fed dish of 0.48 m diameter (18.9") is equipped with a circular polarized horn feed integrated with a 3 stage preamplifier, built by Freddy, ON6UG. From there with about 0.75 m RG-400 to a coax-waveguide coupler, another 3-stage amplifier (MKU 243 WS), a wave-guide filter at 24.048 GHz, and a mixer (MKU 24 RXL) with a local oscillator (MKU 12 LO #4) at 11.376 GHz. The IF of 1.296 GHz is fed via 10 m RG-400 and 30 dB attenuators to either an IC-1271 or an IC-970/UX-97. Noise and signals are measured at audio frequencies with an AC multimeter (0.5 V full scale). Audio amplification is adjusted fully clockwise, and RF amplification is used for obtaining a proper level. AGC, although it cannot be switched off explicitly, seems to be non-active. The overall frequency accuracy, checked with harmonics from S and L band, is better than +/- 10 kHz. 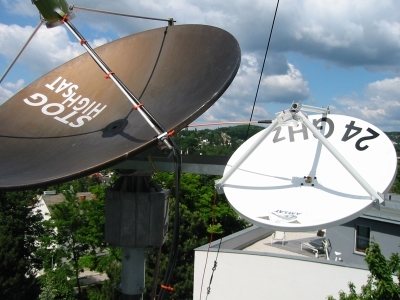 The 24 GHz dish is mounted next to an 1.2 m dish (S-band) on a JRC/EGIS HAM antenna rotator. Due to some mechanical damage the 1.2 m dish turned out to be unusable on 24 GHz, while it is quite reasonable on 2.4 GHz. An overview and summary of the observations is presented in Table 1. While initially the aim was doing QSOs, it was soon clear, that observing the beacon would clarify some of the difficulties experienced with the QSOs. Beacon frequency and strength was recorded. Details of the frequency behaviour will be presented further down. Beacon strength was significantly stronger when the passband was switched off. Since the "beacon only" period of 2 MA was changed from the beginning (MA 124 to 126) to the end (MA 132 to 134), the acquisition became more difficult. The limiting behaviour of the K-Tx path causes a lot of disturbances of the beacon by other stations (using the S band downlink) in the passband. CW signals were chopping the beacon signal dramatically and SSB signals were distorting it, sometimes the beacon was disappearing completely in the noise, while the other stations were still R 5. The influence of the squint angle on signal strength is not as obvious as one would expect. The squint angle was calculated from the Alon/Alat figures given in the header of the telemetry A-blocks. These did not always agree exactly with the (more precise ?) figures from the YACE. YACE was activated always on orbits, when the K-band activity was not in the visible range from Europe. Therefore a direct comparison was not possible. Second, the antenna rotator is not as precise as one would expect. Since the elevation is controlled by a linear motion, some minor deviations of the elevation display occur. A full calibration of the display versus actual antenna direction has not been done. Due to the changing signal strength of the beacon an optimisation of the signal was not always very easy and probably not precise enough. For reasonable communications with a .5 m dish, the squint angle should be less than five degrees. Finally, a weather report should be included in any description of K-band activities. Rain and snow make K-band activities definitely impossible, clouds and fog will have a significant impact. Figure 1 shows the measured beacon frequencies of ten orbits during the whole observation period. The frequency drift encountered is significant. At the start of the activity period the drift is around -5 kHz/min, slowing down to about -1 kHz/min, in one case down to -0.5 kHz (where at MA 182 Doppler shift was helping a lot). Of course, QSO signals are subject to the same drift, and following a SSB signal at 5 or 3 kHz/min (much more than on any LEOS) is quite a challenge. The frequency drift encountered at the ground station does not give any clues, therefore the Doppler shift has been subtracted. Figure 2 shows the result. We see now the actual beacon frequency, with a negative drift during the activity on each orbit as well as a negative trend during the whole period from August to October. There can be seen some standstill from orbit 1346 to orbit 1363. The drift during each orbit can certainly be interpreted as a negative temperature drift, showing the warming up of the transmitter. There is no temperature sensor near the K-Tx and therefore we can but roughly compare the temperature of the satellite, represented by the heat pipes. Figure 3 shows the temperature of the ends of two heat pipes (telemetry data at the beginning of the K-band activity, MA 124 and 174 respectively), and we see quite a good match with the beacon drift. Especially the behaviour between orbits 1346 and 1363 gives a strong indication. May be, during the next activation period the temperature drift of the satellite will be different, and we can verify this hypothesis. For antenna rotator calibration the sun was used on several occasions and obviously also the sun noise was measured. Values were between 3 and 4.5 dB, but no striking agreement with the solar flux measured at 2.8 GHz by the NRC/DRAO was found. Many more measurements, hopefully also from other stations, will have to be collected and analysed. As mentioned previously, for stations with a 0.5m dish, the squint angle should be below five degrees. For example, for a connection Europe-Japan, the apogee should just be over the middle point (Afghanistan), and also for that middle point squint should be near zero. If you consider the weather conditions on both ends, and consider also, that one partner might be restricted to weekends, the occasions become extremely rare. Figure 4 shows the Alon/Alat values (derived from YACE, stated accuracy +/- 0.2 degree) during the time frame under discussion. Prediction of zero squint for a certain location becomes practically impossible. QSOs with K-band downlink on both sides are still a challenge. An extension of the K-Tx operation (to 20 or 30 MA units) would offer multiple improvements. First, the temperature of the transmitter would come nearer to an equilibrium and Doppler shift in addition would help to reduce the total frequency drift. Second, the probability of getting low squint angles, despite the problems with the mystery force in Alon/Alat, would increase. 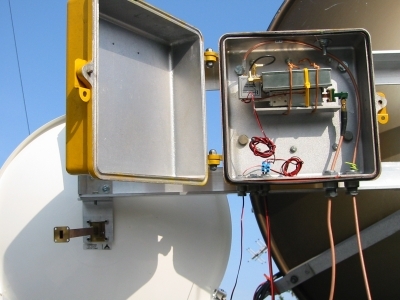 And finally we should try to separate S-band and K-band downlinks - switching off S-band is certainly not an option. How about promoting a slogan like "AO-40 S-beacon +/-40 kHz, 24 GHz-beacon +/-12 kHz" ?